Ewww … what’s that smell? While most of us will refrain from voicing such a thought in a public setting, it’s easy to envision a small child blurting out the accusation. Aromas can leave a potential buyer with a negative impression and a memorable smell that might make them think twice about purchasing the home. A smell can be overwhelmingly nostalgic, triggering powerful images and emotions before we have time to edit them. The scent of fresh baked apple pie may remind you of your long-deceased grandmother or a certain perfume may remind you of a girlfriend from 30 years ago. The sense of smell is one we often take for granted. We tend to focus on what we can see, touch, taste and hear. But in real estate, just as seeing ants in a home will turn off a buyer, so will experiencing a home that smells of cat urine or cigarette smoke. So how do you make a home smell like somewhere buyers would want to live? Providing a neutral canvas allows buyers to imagine their life in the home. A strong odor in a home that doesn’t fit their lifestyle can ruin the entire scene. 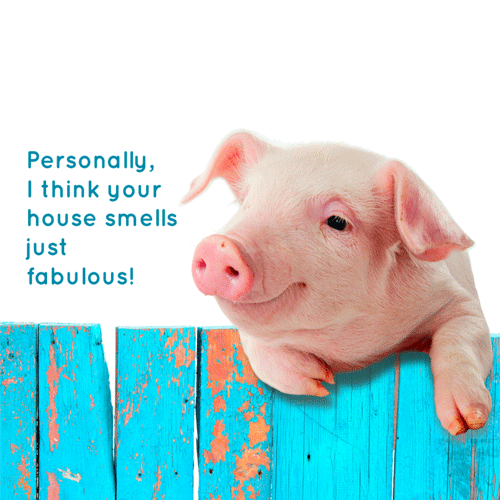 The best smell for a quick-selling home is no discernible smell at all. When exposed to an odor for a lengthy period of time, what once may have registered as an obtrusive scent turns into one that no longer registers as offensive. This phenomenon, known as “nose-blindness,” is a real thing and much more than just a gimmick to sell more air freshener to those that are stinky-scent paranoid. So as a home owner, you may have become nose-blind to your home's odors. Odor control may be one of those uncomfortable conversations that needs to be had between an agent and seller before the home listing becomes active. According to a survey done by the housekeeping channel, the top five worst odors in a home include (in order) the smell of rotting garbage, pet smells, mold, body odor and tobacco. Luckily, some of these odoriferous issues have an easy fix. Smelly garbage can? Take out the trash and scrub the container thoroughly with a strong cleaner. A simple (and obvious) action that usually resolves the problem. While the house is on the market, make sure trash gets taken out more frequently to prevent this unwanted smell. A bedroom that smells like a post-game locker room for the New England Patriots is not going to help a house sell. Thorough cleaning, swift removal of dirty laundry and a set of charcoal odor absorbers for each pair of often-worn shoes will help avoid this offensive smell. Moisture-induced problems are often more difficult, as they cannot be combated without determining and remediating the source of the moisture -- which may not only be time consuming, but also a expensive. Often mold remediation companies, structural engineers and home inspectors can be great resources for determining the cause and the appropriate treatment, depending on the scope of the problem and the types of mold and other potentially aggravating allergens. What all odors have in common is you must remove the source of the stench first; otherwise any other steps are a waste of time, money and energy. These issues can be tough, because when it comes to our pets, most pet owners are not willing or financially able to board their four-legged family members while their house is on the market. What to do? Be more diligent about grooming Fido, brushing Fifi and scooping out Frisky’s litter box. Consider washing "well loved" dog toys and beds also, as they may be adding to the odor problem. For odors that permeate carpet and upholstery, a sprinkle of baking soda can be very effective. Let it sit and then vacuum with a HEPA filtered vacuum. This solution can work wonders. However, if the carpets have pet damage, both the carpet and pad may need to be replaced. In addition, the subfloor may need to be treated or even removed. The nose knows. The moral of the story is to figure out what's causing any odors in your home and resolve the issue; don’t try to mask odors with scented candles or freshly baked cookies.